Designed to resemble an ice cream scoop this beautiful hookah can sure churn out some tasty flavored smoke. Featuring a bohemian-style glass base with a layered appearance and a sturdy stem that unscrews into 2 pieces for easy cleaning and storage, this unique Hookah comes with a matching 6 foot synthetic leather hose and porcelain Mya bowl. 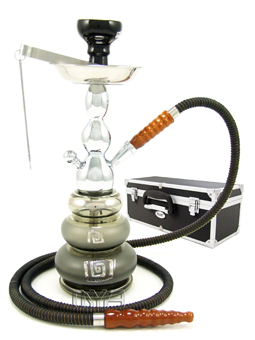 This Hookah is stored along with its accessories in a sturdy, hard style carrying case. The Gelato Mezzo may be converted to a two hose Hookah by utilizing stem adapters that contain the auto-seal system. The Auto Seal system eliminates the need to use rubber stoppers and flip caps when there are multiple users smoking the Hookah. Multi Hose Capability This Mya Hookah may be converted into a 2-Hose model which utilizes the auto-seal system by purchasing additional stem adapters. Click Here to view and purchase the required Mya stem adapter.